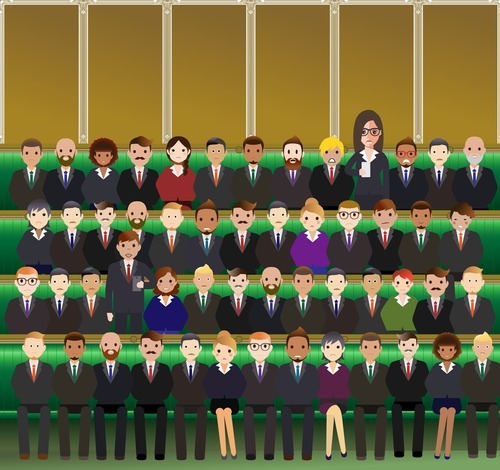 Britain is feeling a whole lot better now that differences have been set aside and a ‘no deal’ option is off the table, but can you spot the happier MP in this visual puzzle from Lizi’s Granola, who has created a new set of ‘Brexiquette’ rules, with TV etiquette expert William Hanson, to help politicians keep calm and ‘do the right thing’ as the clock ticks down on Britain’s EU exit on March 29. A TV etiquette expert and Royal commentator has created a new set of ‘Brexiquette’ rules to help politicians keep calm and ‘do the right thing’ as the clock ticks down on Britain’s EU exit on March 29. As British politicians listened to the Queen’s request to find 'common ground' and respect 'different points of view' in Tuesday’s vote, the country is finally beginning to feel a sense of order as the Prime Minister begins new negotiations with Brussels. But William Hanson, who regularly appears on This Morning and BBC Radio, claims MPs have still lost sight of traditional ways of correct behaviour and need to keep their sense of British-ness as proceedings continue. Tutting, scowling, shouting and whipping-up a media frenzy are currently commonplace in Parliament - but show a basic lack in classic British behaviours, which have been lost among ongoing Brexit negotiations, he claims. Working with Lizi’s Granola, Hanson has compiled a list of how politicians could rediscover their sense of decorum in the House of Commons and make for a whole lot better Brexit - including showing more kindness, respect and cooperation for fellow members. Good manners are all about looking after others - they are self-less not selfish. Invest in some quality time sitting down, conversing with your fellow colleagues to see if you can help them with any of their own problems and come up with a sensible solution. A problem shared, is a problem halved, remember. They’ll pay back the kindness and generosity in spirit when the time comes…maybe at the next vote! Spread the positivity by changing how you acknowledge strangers. No need to say hello to every one you pass, but give a polite smile to most and say good morning/afternoon to at least four people a day. There’s lots of pantomime noises that come from Parliament, but tutting is the worst! Curb the semi-silent, passive aggressive rebuke – it will only get the oppositions backs up. Nothing is nicer for someone than receiving a handwritten thank you letter or card in the post. A text or email that you may have written after you’ve left the green benches is not the same thing. Write short missives to those who gave you support. When at work, try to make friends with a colleague you don’t know overly well. Find out more about what makes then tick and what irks them. You may find you have more in common with them than you think. Arrange to see people for breakfasts out and about. They get you up and out the door, ready to tackle the day sooner. Save yourself a sore head by cutting back (or even cutting out) alcohol. As we all know, breakfast is the most important meal of the day. Introduce a new option for your morning fuel, such as Lizi’s Granola, to give your mood that extra lift and for slowly release energy to keep you going throughout the day. Will definitely keep the ‘Commons Grouch’ away! This press release was distributed by ResponseSource Press Release Wire on behalf of Forge Communications in the following categories: Men's Interest, Women's Interest & Beauty, Food & Drink, Public Sector, Third Sector & Legal, for more information visit https://pressreleasewire.responsesource.com/about.